Casey Stoner’s hopes of retiring from MotoGP at the end of 2012 as world champion have suffered a crushing blow today after the Australian was forced to withdraw from this weekend’s Czech Republic round in Brno. Stoner has been advised by his personal medical advisors to fly home to Australia for surgery on the right ankle he damaged in a horrific qualifying high-side crash five days ago in Indianapolis. The 26-year-old produced a heroic ride in Indianapolis to finish fourth and he had flown from America to the Czech Republic with the intention to ride. It is not clear at this stage how long Stoner will be sidelined for, but his hopes of defending his world title appear over. 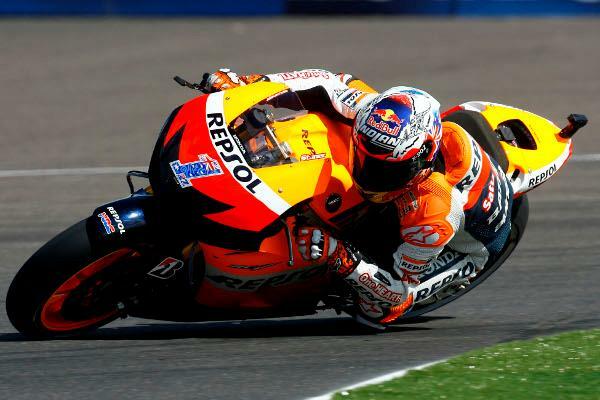 The double MotoGP world champion already trails Spanish rival Jorge Lorenzo by 39-points.